This low-carb flax meal pizza crust recipe is a variation of our ​flax meal focaccia bread recipe which is a dense, good-for-you type of bread. This recipe makes a pizza that is about 12 inches in diameter, although you can spread it thinner and larger if you want. The crust is baked first, toppings are added and then the pizza is baked again until the toppings are cooked. In a medium bowl, whisk together 1 1/2 cups flaxseed meal, 2 teaspoons baking powder,l 1 teaspoon salt, 1 teaspoon oregano, sweetener to equal about 1 tablespoon of sugar. Add 3 tablespoons of oil, 3 large eggs, and 1/2 cup water and mix very well. Let sit for about 5 minutes to thicken. Spread on a pizza pan that has been lightly coated with cooking spray (I put it on a silicone mat or greased parchment paper). Bake for 15 to 18 minutes until cooked through, then add toppings and cook until they are done. Sauce: Most pizza sauce and red pasta sauces have sugar in them. The alternative? Sugar-free pasta sauce works very well for pizza, and most grocery stores have one or two brands that work. Look for a sauce that has no more than 6 to 7 grams of effective carbohydrate per 1/4 cup serving. Cheese: Whole milk mozzarella cheese has about 2.5 grams of carbohydrate per cup, and partial skim has slightly more. Most other mild cheeses have similar carb counts. 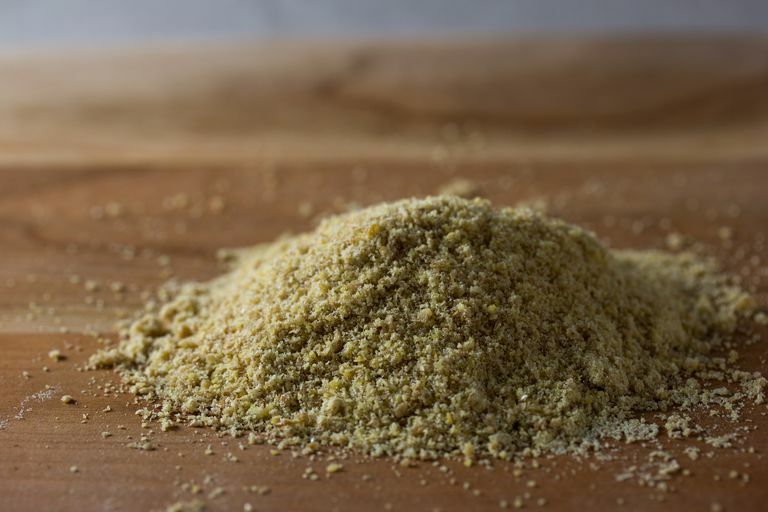 Parmesan cheese has about 1 gram of carbohydrate per ounce (about 5 tablespoons of grated cheese). So be careful in the cheese department. Toppings: Most meats only have scant amounts of carbs, although some sausages, including pepperoni, have some added carb. Pizza vegetables are typically low in carbs, including mushrooms (1.5 grams per cup, sliced), green peppers (2 grams per 1/2 cup, chopped), and olives (1 gram per 4 large olives). If you don't have the time or desire to make your own pizza crust, try going bottomless—just eat the toppings! When everyone else has ordered pizza, just don't eat the crust (and get a salad on the side).